The BBC’s Global Health correspondent Tulip Mazumdar has received Crick Science Journalism award at the University of Northampton. The award is given to the journalist who makes an important scientific issue clear and understandable to a general audience. Tulip is being recognised for her reporting on the Ebola outbreak in West Africa earlier this year; a story which continues to be of major concern. The ceremony was held on Wednesday (October 21) at the Grand Hall at the university’s Newton Building on St. George’s Avenue. She said: “I am very pleased and proud to receive this award, and I would like to use this opportunity to pay tribute to the brave people and medical personnel in Sierra Leone and elsewhere in West Africa. Following her receipt of the award from university vice Chancellor Professor Nick Petford,Tulip gave a lecture about the Ebola outbreak and how the BBC has tried to cover the disease while providing health security for its personnel. In the afternoon she ran a workshop for university journalism students and discussed her work and career which included working on BBC 1Xtra on the flagship BBC Radio One’s Newsbeat programme. 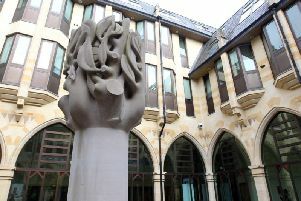 The prize is named in honour of the Nobel-prize winning scientist Francis Crick who was born and raised in Northampton. As a boy he conducted his first scientific experiments here, blowing up bottles of chemicals with electrical charges in his parents’ home. In 1962 he was awarded the Nobel Prize (along with his colleague James Watson, and Maurice Wilkins) for discovering the structure of DNA - one of the great scientific advances of the 20th Century. He went on to work on the challenge of cracking the genetic code which led ultimately to the mapping of the Human Genome in 2003. He was also a great communicator of science, and early in his career considered becoming a science journalist.